When Cardinal Joseph W. Tobin assumes his role as archbishop of the Archdiocese of Newark, N.J., he will be farther away than most Catholics in central and southern Indiana would prefer—about 700 miles away, which equates to roughly 11 hours of driving or two hours of flying. Nevertheless, he will not fall completely off our radar. There will be opportunities for possible Cardinal Tobin sightings in the archdiocese in the future. Take, for instance, the National Catholic Youth Conference held every other year in Indianapolis at least until 2023. There are high hopes that he could be present for at least one if not more of them, given his dedication to nurturing the faith of Catholic youths. One future return of the cardinal is guaranteed in June of 2017, when the U.S. Conference of Catholic Bishops meets for three days in Indianapolis for a semi-annual general assembly. While Cardinal Tobin won’t have time to be out and about much, readers of The Criterion will be sure to see him on the pages of the newspaper as reporters cover the event. Another sighting could also happen next June when 21 men will be ordained as permanent deacons in the archdiocese. A bishop is required to celebrate the ordination. If a new archbishop has not been appointed to the Archdiocese of Indianapolis by that time, it is possible that Cardinal Tobin could return to Indianapolis to do the honors. A select few Catholics in central and southern Indiana will have the privilege of having a private dinner with the cardinal in the near future. Cardinal Tobin was on the auction block recently for a few organizations, raffling off dinner with him to raise money for worthy causes. 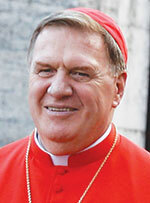 Cardinal Tobin has promised that he will honor this privilege to those who won those bids. Whether or not Catholics see Cardinal Tobin in person, readers of The Criterion are guaranteed to read about him in the paper in the future. As one of only 18 American cardinals and one of seven residing in the cardinal-heavy East Coast, Cardinal Tobin will likely be turned to frequently by the media to serve as a voice for the Church. So not only will his goings-on appear in The Criterion simply because we want to keep up with our former archbishop, but also because he will likely appear in Catholic News Service stories of national or international interest.